A large anti-government protest in Romania's capital, Bucharest, turned violent as demonstrators and police clashed, state media reported, leaving many in need of medical care. Tens of thousands of people showed up to protest Friday in front of the Government House in the capital's Victoriei Square, state-run news agency Agerpres reported. The rally, organized on social media under the motto "Diaspora at Home," called on Romanians living abroad to return home and gather at the square to protest what they say is a corrupt government. The crowds shouted slogans including "Diaspora is with us!" and "Resignation, Resignation!" the news agency said. Tear gas was fired by the police, or gendarmes, as they clashed with protesters, Agerpress said. Initial data indicated that more than 400 people received medical care at the square and two gendarmes were attacked, it said. 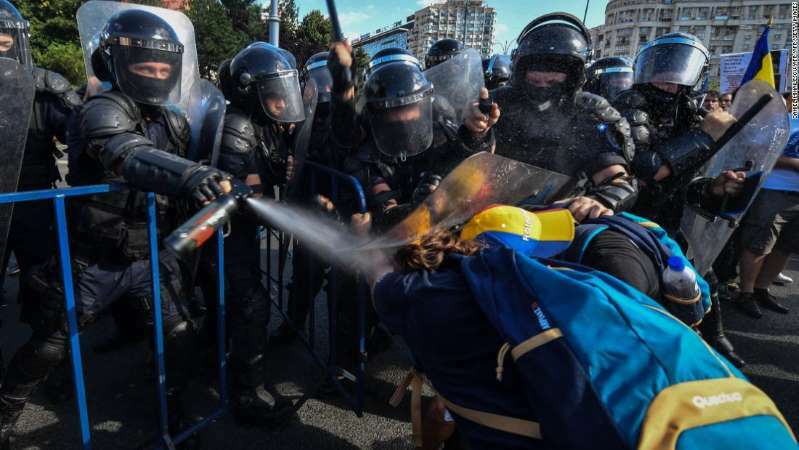 [post_ads]Romania's President Klaus Iohannis condemned the "brutal intervention of the Gendarmerie" in a statement issued late Friday night, saying their actions were "strongly disproportionate with the demonstrations of the majority of people in Victoria Square." He called on the country's Interior Ministry to "urgently explain" the way in which the event was managed, saying: "The attempt to defeat the will of the people through a violent reaction of the law enforcement forces is a condemnable solution." The protesters also held a moment of silence in memory of those who died in the 1989 Revolution and several speakers accused the political system of lacking alternatives, state media reports. There were several protests in Western cities earlier in the week. Critics are angry over what they say is entrenched corruption, low wages and attempts by the governing Social Democrats (PSD) to weaken the judiciary, Reuters news agency reported. Romania was ranked 49th out of 180 on Transparency International's Corruption Perceptions Index for last year, below most other European nations. The Council of Europe's anti-corruption group, GRECO, published a report earlier this year, which pointed to Romania as being among a handful of countries in which legislative initiatives either reversed anti-corruption measures or risked breaching international anti-corruption standards.